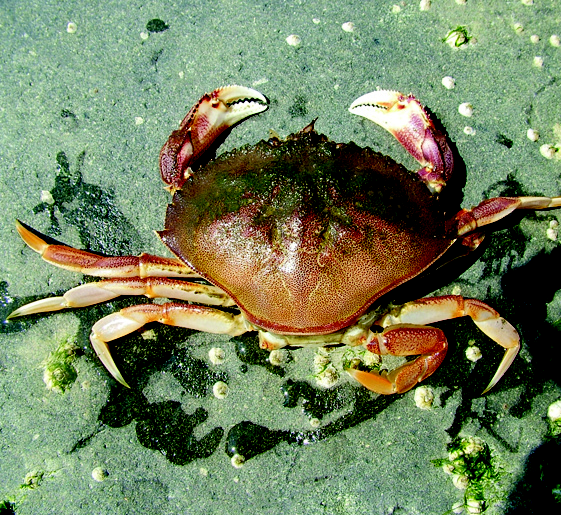 Dungeness crab. Photo: Leo Shaw, The Seattle Aquarium. While many species of invertebrates (e.g. copepods) complete their entire life cycles in the water column, many cnidarians, arthropods, mollusks, echinoderms, annelids, tunicates, and fish species are present in the plankton for only a portion of their life cycle. Most filter-feeding pelagic zooplankton, as well as many suspension-feeders, are dependent on phytoplankton for food. They are thus an important step in the pelagic part of the food web, transforming the organic matter derived from primary production into food for invertebrates, fish, birds, and mammals. The distribution and abundance of zooplankton are probably correlated with changes in distribution of phytoplankton (Strickland 1983), but quantitative studies of the zooplankton assemblage in the Puget Sound region are rare and quite limited in scope. The benthic habitats of Puget Sound are home to thousands of species of herbivorous/detritivorous invertebrates. These species include those that live in the bottom (infauna) and on the surface of the bottom (epifauna) and that may be motile or sessile (Kozloff 1983). The adult stages of a number of benthic species are economically important and include native species such as pandalid shrimp (Pandalus spp. ), Dungeness crab (Cancer magister), geoduck clam (Panopea generosa), and butter clam (Saxidomus giganteus), as well as non-native species such as Japanese littleneck clam (Tapes philippinarum) and Pacific oyster (Crassostrea gigas). These benthic invertebrates also use a variety of feeding methods, including filter or suspension feeding (mussels, clams, scallops, oysters, worms, and barnacles) and grazing (sea urchins, snails, limpets, and chitons). Detritivorous invertebrates include sea cucumbers, crabs, amphipods, and isopods. These taxa are preyed on by other invertebrate, fish, mammal, and bird species as adults or as eggs and larva when vast amounts are released during reproduction.